Before the fall Adam and Eve where quite content in the Garden of Eden. Innocently enjoying the garden and each other, they lived in natural contentment. Then they ate the apple. The knowledge of good and evil. And they suddenly became ashamed of their bodies and desires and were cast out of paradise. It seems to me that the apple can repesent only one thing – the birth of morality. It was then that people were masochistically turned against themselves and their desires, creating a labyrinth of our minds, hiding the beast of repressed cravings, and making human nature something sinful. It seems to me that this harsh light of moral purity casts the deepest, darkest shadow, creating the most contrast between the good and not so good parts of a person’s character. Indeed, the soft light of tolerance for normal, natural human desires and behaviour casts the weakest shadow, thereby avoiding the intensity and barbarism of the return of repressed needs. For me, the guides of our behavior, like the containing banks on the river of our will, is love, tolerance and compassion. Treating people not as objects to be moved around as you wish, but rather as subjects, with feelings, desires and dreams, that should be acknowledged and nutured, to allow a person to grow as they are naturally inclined. I call this ethics, or how you treat people, in contrast to morality, a set of standards that deny human nature and our authentic needs. If you like these thoughts and would like to read more, please check out my previous newsletters at my blog – http://www.kloschinskyblog.com. 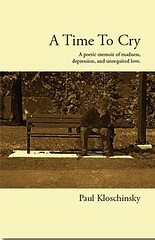 I also want to invite you to check out my work in poetry, photography and songwriting at http://www.kloschinsky.com. I recently released a new single. “Better Late Than Never” , which is available on iTunes.